Today, we launch Not The Mama, an occasional series , as reported by my friend Martin Griff. Martin is traveling North America this winter, skiing at resorts large and small. 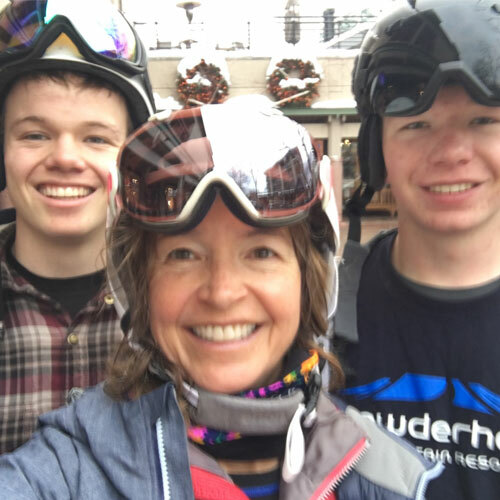 A newspaper journalist by education and profession, he’s kindly offered to share some of his insights, experiences and musings as he lives the ski bum dream. I skied with my nephew at Fernie Alpine Resort in British Columbia, Canada on Thursday. The snow was deep, wet and heavy and his legs are 35 years younger than mine. Before lunch I literally cried uncle and suggested we take the long, winding Summer Road intermediate trail back to the base area for lunch. We were stopped by a ski patroller who asked us to move far off the trail so two uphill bound grooming machines could pass by. It is unusual to see grooming machines on a mountain during hours of operation since heavy machines and skiers are not a good mix. After the groomers passed we headed down the trail of fresh corduroy. Can’t beat first tracks at 12:30 p.m.
We later learned that the grooming machines were heading up the mountain to retrieve the scaffolding that surround the top of the White Pass quad chair. The chair is the gateway to the top of the mountain and some of its best bowl skiing. The top bullwheeel bearing had failed and the lift has been closed for about a week. In addition to our good fortune, those groomers were a sign that the lift should be spinning soon. Smart Tip: For USA skiers, Canada is a great option. In addition to the terrain, the exchange rate means that 81 US cents buys a dollar’s worth of Canadian goods and services. In other words, that $100 dinner will set you back 81 greenbacks. And Canada doesn’t celebrate Martin Luther King Jr. or Presidents Weekend so those two crowded stateside holiday weekends are less hectic north of the border.